Since August 25, Burmese security forces have been carrying out a campaign of ethnic cleansing against Rohingya Muslims in Rakhine State. Over half a million Rohingya have fled to neighboring Bangladesh to escape killings, arson, and other mass atrocities. The number fleeing during this period has made it the worlds fastest growing refugee crisis and has formed the worlds largest refugee camp in Coxs Bazar, Bangladesh, dwarfing the worlds former largest refugee campBidibidi, Ugandawhich hosts around 270,00. The Rohingya crisis is one of the worst humanitarian crises of our time. Join us on Thursday, September 20, 2018 and hear from a panel of researchers from various disciplines as they reflect on their experiences conducting fieldwork in the Rohingya camps. 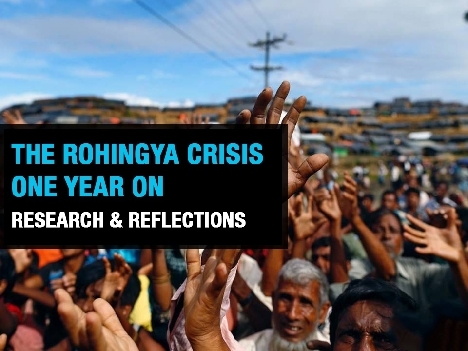 This event will also serve as the first gathering of a Rohingya crisis working group, supported by the Chowdhury Center for Bangladesh Studies. Students, researchers, and practitioners are invited to develop ideas and collaborations to further our collective work related to the Rohingya crisis. ROHINI J. HAAR MD, MPH, is an emergency medicine physician with expertise in health and human rights. Her work focuses on the protection of human rights in times of complex humanitarian crisis and conflict. She is particularly interested in the protection of health workers and health services. As an emergency medicine physician, she has worked both as academic emergency medicine faculty in New York City and Oakland, as well as on numerous international projects including in Haiti, Senegal, Ghana, Morocco, Palestine/Israel, India and the Thai/Burma border. Dr. Haar has published articles on issues including health in post-conflict states and the reconstruction of health systems after humanitarian disasters. She is particularly interested in developing strong research methodology in fragile contexts. Dr. Haar serves on the board of the SF Bay Area Chapter of Physicians for Social Responsibility and is a consultant for the International Rescue Committee and Physicians for Human Rights. FÉLIM MCMAHON is the Technology and Human Rights Program Director at the Human Rights Center and Director of its Human Rights Investigations Lab. The lab trains more than 100 graduate and undergraduate students from across campus each year in ways to use social media and other open source content for human rights advocacy and legal accountability. McMahon was previously a print journalist in Ireland and then part of a small team that established Storyful, the worlds first social media news agency. Relying on his skills as a reporter, McMahon helped position Storyful as a leader in social media-based discovery and verification of breaking news, pioneering new methods for using and authenticating citizen-generated content and other information shared online. In 2014, McMahon joined the International Criminal Court as an investigator, innovating around the use of information from online open sources to strengthen prosecutions of grave international crimes, including war crimes, genocide, and crimes against humanity. McMahon has a masters degree from Dublin City University. SAMIRA SIDDIQUE is a PhD student in the Energy and Resources Group and researcher at the Renewable and Appropriate Energy Laboratory at UC Berkeley. Her research focuses on development for stateless people and migrants, most recently on energy access and the development priorities of UN agencies and NGOs in the Rohingya refugee camps in Bangladesh. As a researcher at the Bangladesh-based International Centre for Climate Change and Development, she co-designed the first longitudinal environmental monitoring project in the Rohingya camps. Her related research is on climate change adaptation, development, and migration to urban slums in South and Southeast Asia. More broadly, she is interested in how displaced populations, refugees, and migrants are integrated into existing development frameworks, and in conceptualizing a new development paradigm for those that have been systematically othered and persecuted. Siddique is a research fellow at the Chowdhury Center for Bangladesh Studies, as well as a National Science Foundation Data Science fellow. Event moderated Prof. Eric Stover. Eric Stover is Faculty Director of the Human Rights Center and Adjunct Professor of Law and Public Health at UC Berkeley. During the wars in Croatia and Bosnia, he served on several medico-legal investigations as an Expert on Mission to the International Criminal Tribunal for the former Yugoslavia in The Hague. In the early 1990s, Stover conducted the first research on the social and medical consequences of land mines in Cambodia and other post-war countries. His research helped launch the International Campaign to Ban Land Mines, which received the Nobel Prize in 1997. He conducted a survey of mass graves throughout Rwanda for the International Criminal Tribunal for Rwanda in 1995. His most recent books include A Village Destroyed, May 14, 1999: War Crimes in Kosovo (with Fred Abrahams and Gilles Peress); My Neighbor, My Enemy: Justice and Community in the Aftermath of Mass Atrocity (edited, with Harvey Weinstein); and The Witnesses: War Crimes and the Promise of Justice in The Hague; and Hiding in Plain Sight: The Pursuit of War Criminals from Nuremberg to the War on Terror (written with Alexa Koenig and Victor Peskin). We are located at 10 Stephens Hall on UC Berkeley's campus. Please click this Google Maps Link and enter your point of departure.